The lab has four major research areas right now, two in drylands and two in the Arctic. All focus on plant and soil biogeochemical processes in these ecosystems. 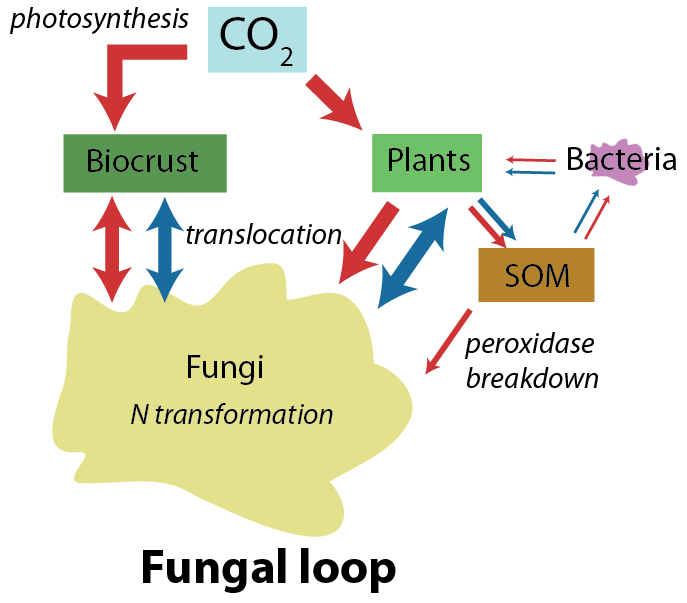 Fungal loop hypothesis: Fungi are uniquely adapted to dry environments and also have exceptional capabilities to move nutrients. As such they are well known in their role as mycorrhizal symbionts to plants that help scavenge nutrients from soils. However, in deserts they may play an even more crucial role by forming extensive webs of biotic connection among the denizens of the desert, specifically plants and biological soil crusts. However, this fascinating idea has not been totally proven. We will use methods such as isotopic tracers to follow elements through the fungal hyphae as well as experimental manipulations of the fungi, the nutrients, and other aspects of the system. 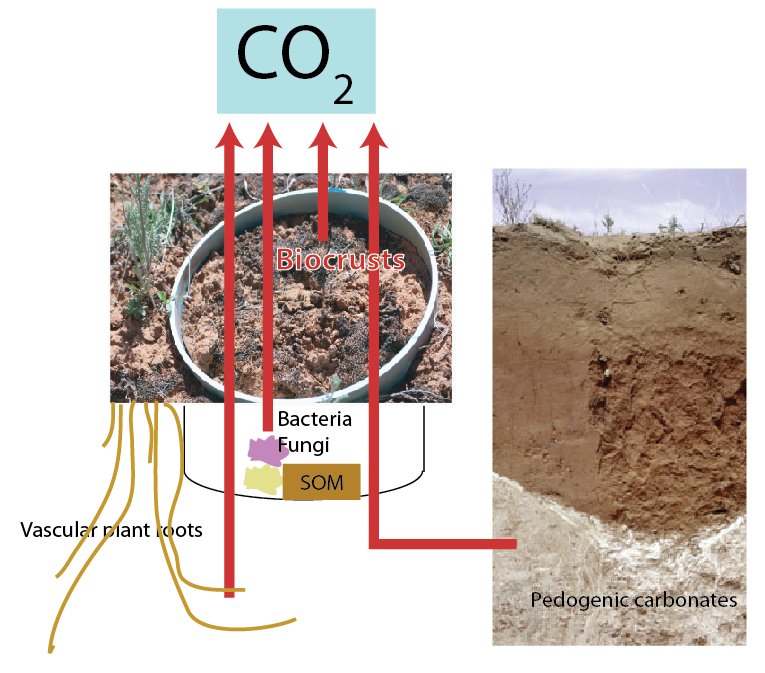 Mechanisms underlying dryland carbon exchange: Recent high-profile studies have highlighted the importance of dryland carbon cycling. However partitioning of the sources and sinks of carbon in dryland ecosystems is poorly understood. Few comprehensive analyses or budgets have been able to put in context the many important parts of the ecosystem, including: plants, soil microbes, physical processes, biocrusts, and more. We have begun making seasonal analyses to link existing data on plant phenology and eddy covariance-derived carbon fluxes. We are also building automated CO2 flux chambers in which we will manipulate the upper surface layers of the soil to assess their contributions to carbon flux. Exchange depot hypothesis: Soils in the Arctic tundra are wet, often bordering on bog-like. As such, we believe that the exchange of materials and energy among the key organisms in this ecosystem are essentially aqueous. In these almost aqueous environments, observation and manipulation of soil pore water chemistry can unveil the key mechanisms controlling C and N cycling. We have seen evidence of the potential predictive power of soil pore water chemistry: in seasonal measurements of soil pore water sugar concentrations, which appear to closely track patterns in plant growth, suggesting that the sugars are being exuded into the soil by plant roots and not immediately taken up by microbes. Exploring the dynamics of these processes at different soil depths and among different vegetation types may yield a greatly improved understanding of C cycling in the Arctic tundra. Enzyme identification: Soil enzymes are regularly assayed, but little is known about the actual enzymes themselves. Recent developments in omics-style analyses now allow the complete analysis of genes present in an environmental sample (metagenomics), expressed genes (transcriptomics), and proteins (proteomics). While these approaches can produce an overwhelming amount of data, we are tackling this challenge to track down the enzymes and the microbes that are creating them. 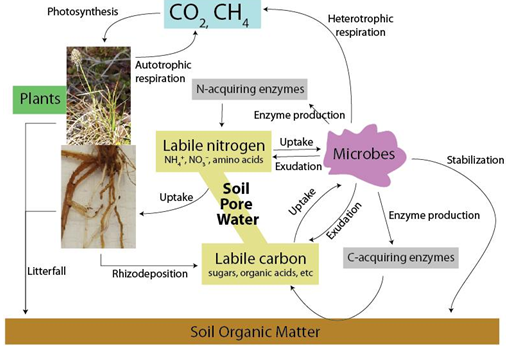 Arctic ecosystems are an obvious place to explore this due to the importance of enzymatically driven decomposition processes in controlling the large soil carbon stocks. Just before I came to UTEP, I worked on biological soil crust (biocrust) responses to elevated temperature and changing precipitation. Our analyses of the net exchange of carbon between biocrusts and the atmosphere in a multiyear 2°C warming experiment (infrared heat lamps) showed increased carbon losses in the warming treatment, suggesting negative impacts of warmer future climates on biocrusts. We also discovered these crusts can perform photosynthesis under snow despite living in the desert. Arctic soils contain large stocks of carbon and may be a significant CO2 source in response to climate change. Using an early-snowmelt×warming manipulation at a site near Toolik Field Station on Alaska's North Slope, our team investigated changes in soil nutrient cycling in response to changing climate and seasonality. Our results showed that snowmelt acceleration causes more rapid early-season nutrient immobilization in soils and that early snowmelt in unwarmed plots can cause season-long reductions in root growth and inorganic N availability due to plant exposure to harsh conditions in the absence of snow. Microbially mediated nitrogen cycling rates are heterogeneous across landscapes, with disproportionate activity occurring in biogeochemical hot spots. My dissertation examined landscape heterogeneity in soil nitrogen (N) cycling pools and fluxes in a 0.89 km2 site at the alpine-subalpine ecotone. My data showed that a large percentage of total inorganic N pool sizes and associated cycling rates were attributable to a small percentage of hot spots. We also discovered a spatially inverse relationship between atmospheric N deposition and N-fixing plant abundance. Over the last 100 years, sagebrush shrubs (Artemisia rothrockii) have encroached into subalpine meadows in the Sierra Nevada Mountains due to groundwater decline associated with livestock grazing. We discovered that sagebrush transpiration does not dry out the soil during encroachment as we hypothesized it might. Using stable oxygen isotopes, we also showed that both young sagebrush plants and resident herbs used shallow soil water but were also able to access deeper water. Nutrient cycling rates increased with shrub encroachment.